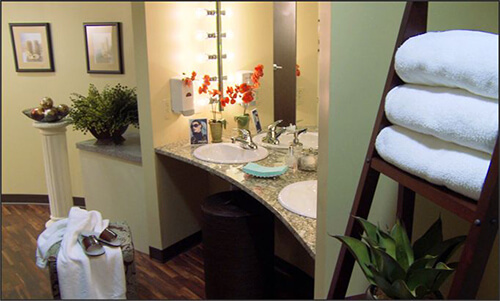 Ziba Medical Spa, located in Saginaw, Michigan is your ultimate source for healthy, beautiful, age-defying skin. – It’s what we do! Ziba offers the most advanced – proven effective – dermatologic treatments available today. From Botox®, line and wrinkle fillers, LightSheer® laser hair removal, customized skin resurfacing and facial treatments, to relaxing massages, cosmetics, skin care products and more. We offer you the distinct advantage of providing services and products allowed only within a physician’s office and care. Our experienced, highly trained clinical staff of physicians, registered nurses, and aestheticians invite you to browse through our website to learn how we can reverse the visible signs of aging and provide you with healthy, younger-looking skin without the expense of invasive cosmetic surgery or associated downtime. You’ll absolutely love Ziba’s tranquil atmosphere complete with luxury spa amenities like women and men’s dressing rooms, showers, complimentary refreshments, and of course – The Ziba Spa Store. It’s our retail concept fully stocked with trusted medical grade skin products, healthy skin cosmetics, and more! At Ziba Medical Spa, we believe that your skin – everyone’s skin – can be beautiful skin. © 2019 Ziba Medical Spa.